Goat’s rue (Galega officinalis) is a federally listed noxious weed. A member of the legume family, it was introduced into Utah in 1891 as a potential forage crop. Escaping cultivation, it now occupies more than 60 square miles in Cache County, Utah, where it infests cropland, fence lines, pastures, roadsides, waterways, and wet marshy areas. A single plant may produce upwards of 15,000 pods with 1 to 9 seeds per pod, which may be spread by water, equipment, or animals. Seeds may remain viable for 10 years. Goat’s rue is toxic to ruminates, especially sheep. Livestock and wildlife losses could be expected to increase especially during dry years if animals graze in infested areas. It replaces desirable vegetation in pastures and particularly along stream banks and irrigation canals. Some of the most productive lowland pastures, irrigated fields, and moist meadows are susceptible to invasion. 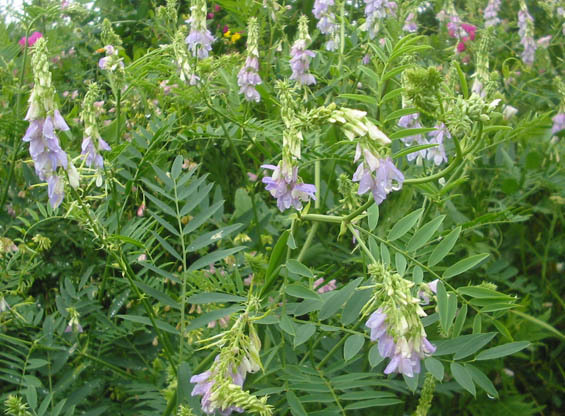 In 2011, Goat’s rue was discovered at the site of the Eightmile Valley restoration project. After the discovery, members of the Lake County Weed Management Area developed a plan of action to control the infestation. The Bureau of Land Management (BLM), county Agriculture Department and Lake County RCD drafted a Goat’s Rue management plan and sought funding to implement control measure practices in Eightmile Valley. In September 2016, the RCD received funding from the Westside IRWMP Committee’s small grant program to begin the control of the infestation. Work began immediately to survey, map, and remove mature plants and seedpods from the 2016 growing season. Work to survey, map, and treat re-sprouts in the infested areas resumed in the spring of 2017.